The CipherLab RS31 Android Barcode Scanner is the next generation of the highly regarded RS30 adding better processing power, more memory and more robust network connectivity options. 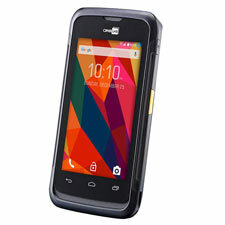 The RS31 is a rugged smartphone equipped with a powerful barcode scanner allowing your mobile workers to enjoy the familiarity of a smartphone while reassuring enterprise managers through its proven industrial design to safeguard both the device and collected data. 4.7" Screen, 1D Linear Imager, 802.11a/b/g/n, Bluetooth 4.1, LTE WAN, GPS, 8MP Rear Camera, 2GB RAM / 16GB Flash, On Screen Keypad, 3000 mAh Battery, Android 7.0 Nougat GMS OS. 4.7" Screen, 1D Laser, 802.11a/b/g/n, Bluetooth 4.1, LTE WAN, GPS, 8MP Rear Camera, 2GB RAM / 16GB Flash, On Screen Keypad, 3000 mAh Battery, Android 7.0 Nougat GMS OS. 4.7" Screen, 1D / 2D Imager, 802.11a/b/g/n, Bluetooth 4.1, LTE WAN, GPS, 8MP Rear Camera, 2GB RAM / 16GB Flash, On Screen Keypad, 3000 mAh Battery, Android 7.0 Nougat GMS OS. 4.7" Screen, 1D Linear Imager, 802.11a/b/g/n, Bluetooth 4.1, LTE WAN, GPS, 8MP Rear Camera, 2GB RAM / 16GB Flash, On Screen Keypad, 3000 mAh Battery, Android 6.0 MarshMallow Non-GMS OS. 4.7" Screen, 1D Laser, 802.11a/b/g/n, Bluetooth 4.1, LTE WAN, GPS, 8MP Rear Camera, 2GB RAM / 16GB Flash, On Screen Keypad, 3000 mAh Battery, Android 6.0 MarshMallow Non-GMS OS. 4.7" Screen, 1D / 2D Imager, 802.11a/b/g/n, Bluetooth 4.1, LTE WAN, GPS, 8MP Rear Camera, 2GB RAM / 16GB Flash, On Screen Keypad, 3000 mAh Battery, Android 6.0 MarshMallow Non-GMS OS.